Intuition & Ingenuity is a group exhibition that explores the enduring influence of Alan Turing – the father of modern computing - on art and contemporary culture. The exhibition features a group of outstanding artists, including boredomresearch and Roman Verostko, whose work responds to key themes within Turing’s life and work. 2012 will be the 100th anniversary of the birth of Alan Turing, one of the greatest minds Britain has produced. Between inventing the digital computer and helping to decode the German Enigma machine, to founding the science of artificial intelligence, the world today would have been a very different place without his ideas. His work on morphogenesis (what makes organisms grow in particular shapes) and the now famous “Turing Test” for machine intelligence have captured the imagination of artists for decades. In boredom research's generative artwork 'Fragments of Lost Flight' (2012) scaled wing fragments are generated by computational mechanisms, inspired by Alan Turing's descriptions of a virtual machine now known as a Turing Machine. Over time a narrow facet of diversity is explored as the 'machine' is fed random programs. Each wing fragment generated by the 'machine' exists only for the time it is on screen and is unlikely ever to be recreated. In nature the process that leads to familiar forms such as butterfly wings are exposed to intense selective pressure with only those of value for survival remaining, in contrast, 'Fragments of Lost Flight' treats all possibilities equally. Taking Alan Turing's ideas about what we would accept as an intelligent machine into contemporary ethical debate,s artist Anna Dumitriu and Alex May are collaborating with Professor Kerstin Dautenhahn and Dr Michael L Walter to investigate their research into social robotics and to ask - do we want and need robot companions? And, if so, what kind's of robot companions do we, as a society, want? Uses for robot companions can vary, forms currently in development worldwide include robot carers for older people, robot nannies to watch over children, sexual companions and home defence robots. Bear in mind that the word robot derives from the Slavic word robota meaning forced labour. 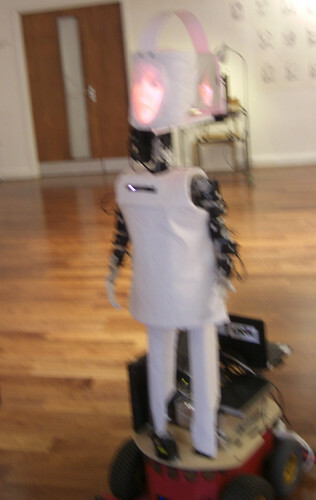 Research shows that often people find humanoid robots appealing as companions and that the head, though technically irrelevant (sensors can be placed anywhere on a robot), acts as a focal point for users to communicate with their robot companions. the robot head shown here is the ultimate in personal robotics. I can take on the appearance of any user to provide a potenially comforting sense of recognition and familiarity, and can aid users in every aspect of their lives, even while they are sleeping (reminiscent of witches familiars from folklore). 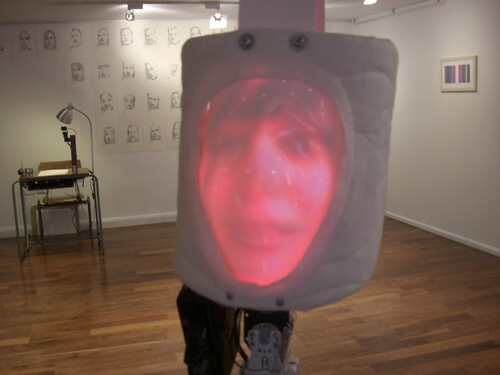 The Familiar head takes features from visitors faces and combines them with robot. This can lead to a feeling of discomfort known in robotics as the uncanny vallery (Mori, 1970), where users feel a sense of repulsion as robots become very humanlike (in this case very like themselves and their companions) but stopping short of being wholly human. Reflective Chat: Ted Talk and Predictions.